Stepper motors are electromagnetic actuators which convert electrical pulses into incremental mechanical movements. They operate differently from other DC motors that simply spin when voltage is applied. The shaft of a stepping motor rotates with a fixed step angle and without the need for position feedback. Motion is very precise in both directions even if running open loop. The direction of the rotation, the speed and the final position of the shaft are in fact determined by the right sequence and polarity of the electrical pulses applied to the coils: speed is directly related to the frequency of the pulses, position is proportional to the number of the pulses and direction is commanded by the proper switching sequence of the pulses. 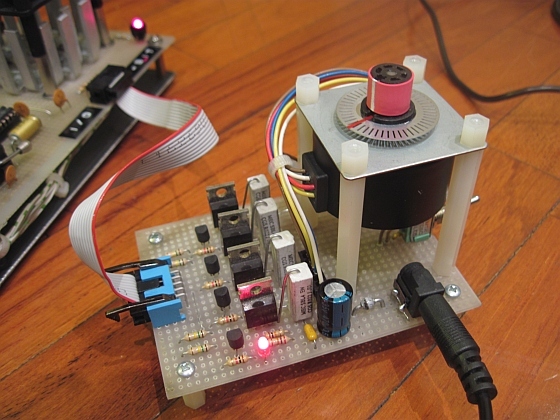 There are several designs of stepper motors. The one used here, taken from a printer, is a five-wire stepper motor designed for unipolar drive with all four commons joined together. The four coils (or four phases) work at 12 VDC and the construction of the permanent magnet rotor allows a shaft rotation of 7,5 degrees per step, so it requires 48 pulses (steps) to complete a full 360 degree rotation. In a stepper motor the shape of the speed–torque characteristic curve can change quite considerably depending on both the type of the driver used (hardware and software) and the load inertia. In this exercise the load inertia is deliberately negligible (just a wheel indicator of shaft position). The hardware for each of the four phases consists of a NPN BJT which drives N-channel MOSFET into saturation: in fact with some power MOSFETs, the TTL voltage might be insufficient to fully turn on the device. The NPN allows interfacing the TTL logic level coming out from APOLLO181 output port to the higher working voltage of the motor board which requires an external 12 Volt, 1 Amp DC, power supply. When the bipolar transistor is OFF, the MOSFET gate potential rises to +12V. This will completely turn ON the MOSFET. If the bipolar transistor is turned ON, the MOSFET gate's potential will drop to VCE(SAT) = 0,2V. This will completely turn OFF the MOSFET. Unfortunately the disadvantage of this practical circuit is that the TTL input signal is inverted by the NPN. A "logical zero" at the input turns ON the MOSFET and energises the winding of the stepper motor phase to cause the shaft to advance through the stepping. This can cause some confusion during the implementation of the algorithm. 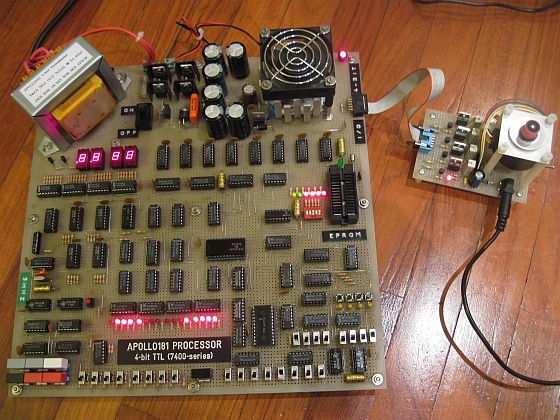 In this exercise APOLLO181 will drive the stepper motor in two ways. The first, basic, is the “full step” method in which only one phase is energized at a time and at 100% of current (i.e. on-off status). The second implemented driving mode is more complex. It is the “half-step technique with compensated torque”. In the common half-step method we have only a single phase ON in one step, and a couple of phases ON in the next step: in this way we have low torque in one step and excessive power consumption in the following step. In order to compensate the higher torque on every half-step we need to apply a lower current to both the coils when they are simultaneously energised: if instead of applying full current, we energise both coils with the 71% of the current, we will get the same weaker torque as during the one phase ON step. This requires input signals with three possible different current levels per phase: 0% (i.e OFF), 71% and 100% (i.e. full ON). If we wish to energise the coils at 71% current, we can build via software a signal with duty cycle (DC) equal to 29% (in fact input signals will be inverted by the motor board circuit). 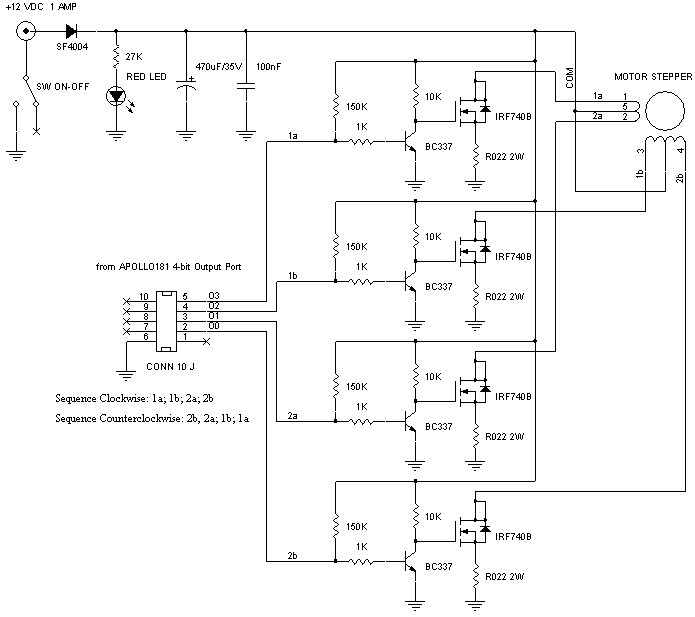 The following diagram is exactly the same as the previous one, but inverted to take care of the mosfet inverter driver. In order to simplify the algorithm and reach higher speed rotation we will keep the DC at 4-bit of resolution. This allows 16 possible values of duty cycle according to the following table. In order to generate a DC approximately equal to 29%, we need to rise ON the signal for five sixteenths of the time and to fall the signal OFF for the rest eleven sixteenths of the time implementing via software a 4-bit delay loop. 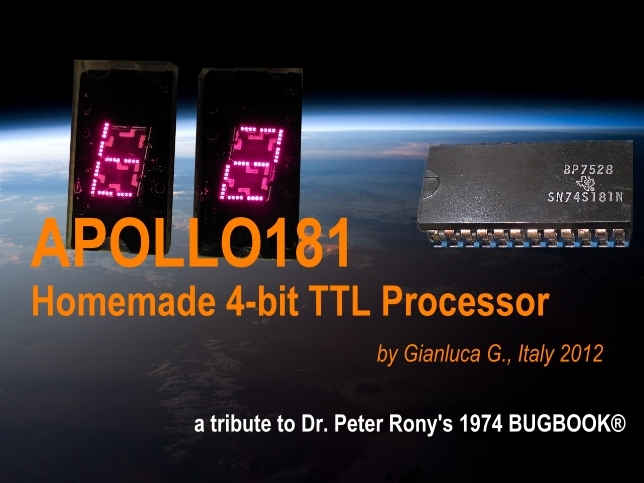 Here below the sequence of [(5+11)]*8= 128 nibbles that needs to be generated from APOLLO181 output port to rotate the shaft for 8 half-steps with compensated torque: remember that the nibble “1111” will put OFF the four coils of the motor, while, for example, “0111” will energise just the first coil. If you need to rotate in the other direction, you have to reverse the order of the commands in the list. Since this is a 7,5 degree stepping motor which needs 48 steps per revolution (or 96 half-steps per revolution), the sequence in the table must be repeated 96/8= 12 times to perform a complete shaft revolution (at the end we need to generate 128*12 = 1536 nibbles per revolution). As you can see, the two ROTATE algorithms are not the same length so we need to put some dummy operations (NOP commands or repeated) in order to run the algorithms at the same speed regardless of the direction of rotation.